Gina Soni is the founder and creator of Gina the Happy Yogi. Gina is the perfect example of how you can train your mind and body to create a fit and healthy lifestyle. Similar to myself she turned her passion of fitness into a career! 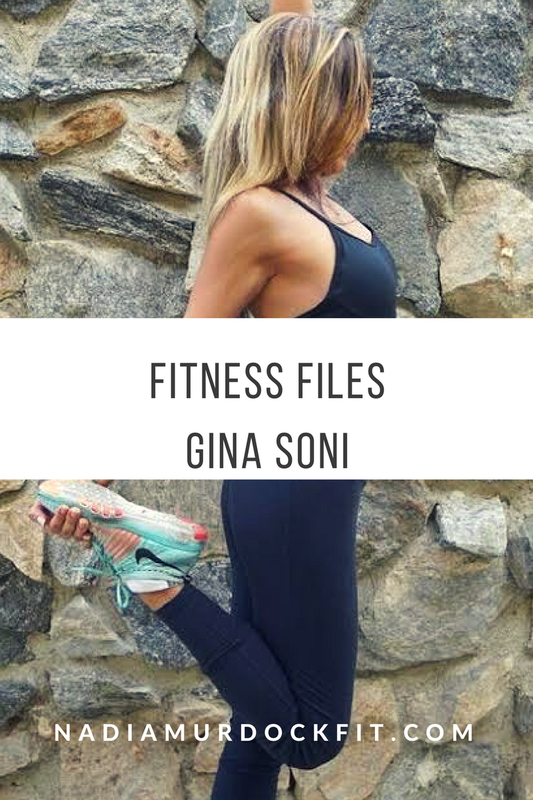 Keep reading to learn more about Gina and her philosophy for realistically staying on track! Gina Soni (GS): I was always a high achiever at school when it came to sport. Hurdles, Netball, Women's Football, Hockey, anything competitive and I was there. It’s a shame I did not push myself further for me to develop my skills at school but certain home factors got in the way, which lead me, further into studying a different field. I soon realized that I could keep the balance between work, life, and sport and then joined a gym near my house. Patrick a kick arse teacher inspired me tremendously and I always looked forward to attending his classes because they were fun, energetic, wicked music and there was a flare about him. He certainly was the one for me to take the next step in starting my fitness journey. As well as attending university, keeping a part-time job I decided to study part-time for my fitness diploma and gained an accolade of qualifications. Scott Pilates, Personal Training, Les Mills Programs, Boxercise, Schwinn Spinning. The list goes on. My parents were not excited with me teaching as they are a little conservative but they soon supported me when my reputation grew with my teaching and the knowledge I had acquired. Always follow your passion; my passion always lied in fitness and regardless of which avenue I took it came back to my passion. Now the interesting part is, how did I find YOGA? Even though I was always into fitness I was never into Yoga because I liked to sweat and do a lot of cardio, and if I was going to spend any personal time for myself it was going to be at the gym working out. My father became extremely ill and the gym was just not doing it for me. So I tried something different, Hot Yoga! It met all my needs with a total transformation, so I then decided to embark on a new journey. YOGA! Yoga helped me mentally to come to terms with my mental balance. GS: I always make sure I have fruit in my bag and home. Almonds, Cashews, Walnuts with cranberries for the sugar fix are always packed in portion size and in my bag. This stops the instant craving one gets throughout the day and after the gym. I have tapped into a few diets as being a trainer you have to try them all for you to be able to give them advice. I have never followed any set diet, but have always eaten healthy. This took me a long time to find out. I always steered away from fast food and only consumed. Vegetables, water, nuts, Yogurt, fresh juice’s, and when I did eat fast food I felt so guilty afterward or I would overeat. Now I do not deprive myself I still eat very well but also eat fast food too sometimes but I make sure I keep the balance. If I have a naughty day I make sure I also have a few good days thereafter supplemented with exercise. This is the key! It takes a lot of effort, mindfulness and most of all DISCIPLINE. GS: As well as my food I balance my exercise routines. I read a lot and try to stay focused, it's not easy. My spiritual practice keeps me on track and positive people around me. GS: Self-discipline, this is the secret to success, I battle with this most of the time. But you have to train your mind to stop and not carried away.I try to surround myself with healthy people and recite mantras. Do whatever works for YOU! Make healthy choices for late night meals. GS: Everyone has their own favorites, depending on training style and preference, and I’m stoked to show mine. Let’s kick off! Divide them up but do them and it works for ME ! FIND YOUR FAVORITE and then switch it up every month.